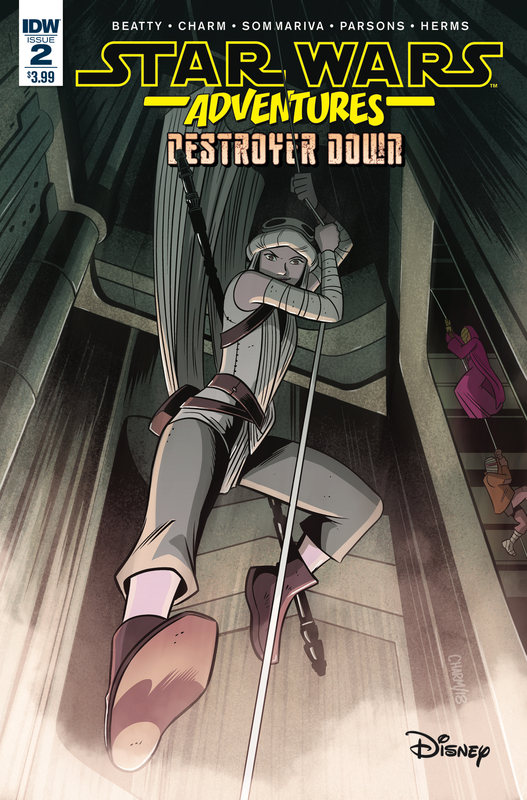 The issue opens with “Destroyer Down – Episode II: Discover” as Rey explores the ghost ship. She finds a new droid friend, and loses a new droid friend. She also runs into Sarko Plank and his goons. At the end of the path lies a Y-Wing in rough shape. Not sure where the story will go from here, but it’s fun. Next up is “The Ghost Ship – Part 2: Lost Shephered.” This one follows a Rebel Y-Wing pilot named Bak Rychuk and his droid Zeet. Zeet shows up in the previous story, as does Rychuk’s hologram and his old Y-Wing. This story is just a fragment as it carries on from the last, and ends with more to come. In this piece, Rychuk’s ship is damaged and he gets tractored inside the ghost ship. Meanwhile, the ghost ship takes damage and has to power down to avoid blowing up. It leaves off there. Not the most satisfying of stories. Both have cartoony, fun artwork with bright colors. The first story is more stylistic, while the second one has more exaggerated characters. Their both good. Overall, not too bad. I give it three out of five baby nexus.